Read pieces published about Maureen Claffy and her artwork, charitable donations and community outreach efforts. I saw a number of attractive yard signs sprouting up around the Fourth of July and could tell immediately that the artist was Hinsdale's own Maureen Claffy. She has an unmistakably exuberant style whether she is painting flowers in a vase, abstract shapes and circles or a series of valentine-shaped hearts in red, white and blue marching across a canvas. 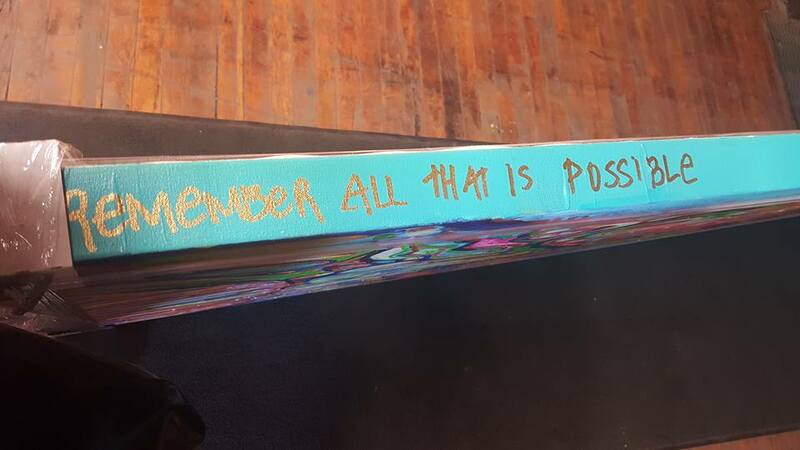 Artist Maureen Claffy donates two uplifting works of art to her alma mater—Hinsdale Central High School. High school typically isn’t an easy time of life for anyone. 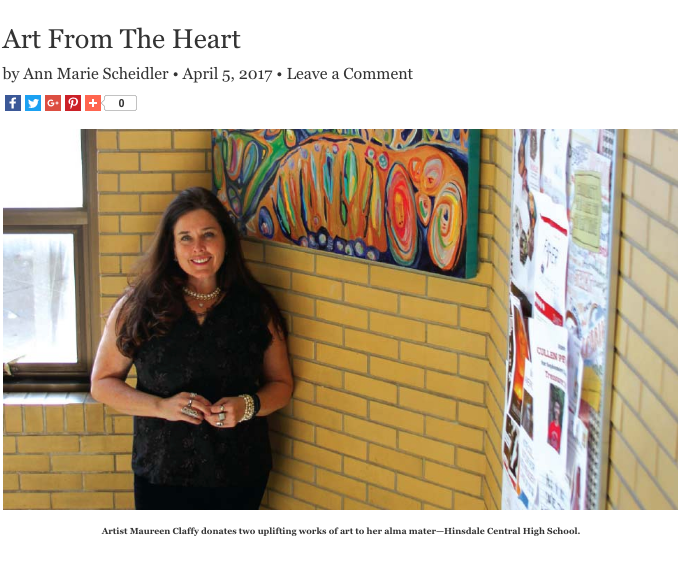 So if there was an act of kindness Hinsdale artist Maureen Claffy could do to enhance the welcoming atmosphere of her alma mater Hinsdale Central, she was going to do it. “If I could do something for the school, I was going to give the best gift I could give,” Claffy says. 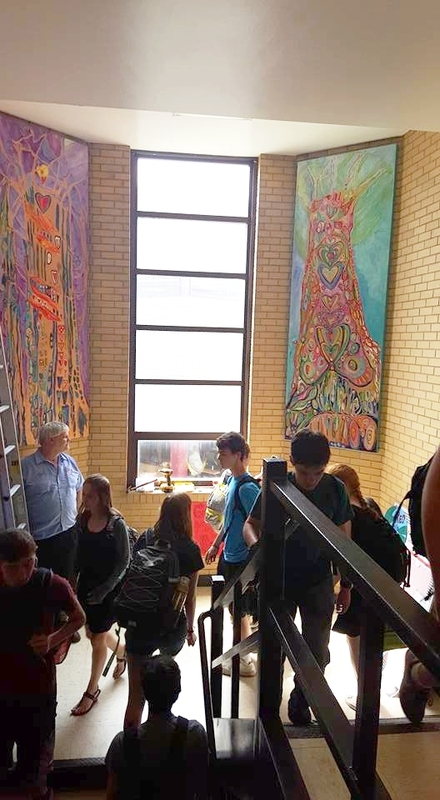 After discussions with the HC PTO and former principal, Dr. Mark Kolkman, about a way to share her gift with the students at Hinsdale Central, Claffy created two nine-foot, vibrant acrylic paintings—valued at more than $25,000—that were installed in one of the stairwells of the high school. Artist Maureen Claffy grew up in Hinsdale and lives here now. She creates fine original art, commissioned work, and museum-quality giclée prints that celebrate the simple joys of life, like home and family. Her recent Mother’s Day Show at the former Gap Building raised $1,000 for local families through the District 181 Foundation and St. Isaac Jogues CCW “Women in Need.” Maureen will participate in the Hinsdale Fine Arts Festival on June 8th and 9th in Burlington Park.